You are here: Home / Food / Does anyone really care about tourist traps? Does anyone really care about tourist traps? One of the most famous streets in Brussels among tourists or people on business trips is the Rue de Bouchers. 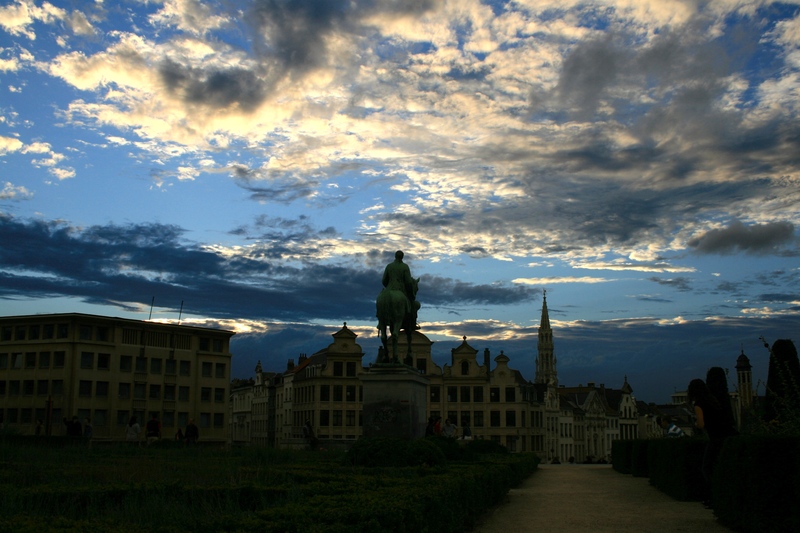 It can be found just a few metres away from the Grand Place. Walking from the street at the Grand Place area last week on the evening when Belgium was playing against South Korea and locals were obviously nowhere near any restaurant without a television set, I could not help but wonder what makes people visit such restaurants around the world. What are they looking for? Why would locals consider such places a tourist trap but so many have no qualms in sitting down and eating there. What is so attractive about waiters greeting you in all languages as they try to guess your nationality to try and get you in? In the case of Brussels, are the mussels and fries served in such places so different in quality to restaurants which cater mainly for locals? Do the tourists who sit down to eat in such places care about the difference? Are they more interested in the experience of eating al fresco as the day gets longer as long as they sit and enjoy a glass of beer or wine? Is the location more important than quality? What triggers such behaviour? Is it the wisdom of the crowds? This is a common phenomenon not only in the city I know best. Tourist traps can be found pretty much in every city. The more tourists a city attracts the more you are likely to find such places. Take cities like Paris and London. They are among the top most culinary destinations but get it wrong and you are likely to end up being extremely disappointed. Have you ever noticed how many times bars, restaurants and cafes in the best locations or with great views have the lousiest service? Is there a correlation between location and quality? Do places which cannot attract customers on the basis of location go the extra mile to please their customers for this reason? Are they more passionate about the food they serve, the provenance of their produce? But for the many who frequent such places, does it really matter? a good question, i would like to know what u think too. myself, i think it is the location. there is a steak house in leicester square, and they have other branches all in prime location, the locals and critics scorn it and bad mouth it , but i see they are always busy every time i happen to look inside. they surveyed and asked some of the customers and they are all tourists, whether from overseas or british tourists living elsewhere in britain, and they said it is the location, one said it is a thrill they wont get to experience, saying its leicester square!!! we are in the middle of what london is all about. so it looks like it is location, location, location. I would agree that location location location is important particularly if you are a tourist. Personally I would prefer to have just a beer or glass of wine in a place with a great location if the food is not so good. When I am travelling food is clearly a big part of the experience, so while location is essential, you tend to remember a memorable meal. Unfortunately many of these memorable meals wherever you go are not about location. What u wish is for those who have location to care much more about good food and service. i think in an ideal world a restaurant in a ideal location will also give great food, great service, and reasonable prices, but i am not holding my breath. haha. if great location can bring in customers who would only visit once, i dont blame the owner for not providing the other perks. they can get all the customers they can accommodate as it is. the reason why out of the way restaurants have to provide good food and keep prices down is because their location is out of the way and they dont get passing trade. it is in a way capitalism at work, in the sense the it is a case of demand and supply. so those of us in the know will go out of the tourist paths to eat or to stay as they are better value for money. it has always been thus. though if u are a tourist and have limited time it may defeat the reason for your visit and curtail your enjoyment if you have ot go out of the way, and have to travel a lot to get to the tourist sites. that is why tourists are not enticed by cheaper costs , when it is once in a lifetime, costs , within reason, dont influence tourist decisions, at least that is what i notice when i host my friends who come to visit london. The law of demand and supply always wins in the end. It should be up to discerning customers to vote with their feet and try to change this practice. Unfortunately that is unlikely to happen. Sometimes it is not even about the costs. Sometimes the tourist traps are cheaper than the better places.